Merissa has been with the LOC team since the beginning of 2007. Her warm demeanor and positive attitude make her a breath of fresh air to be around. 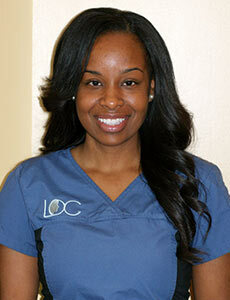 She loves the dental field and wishes to continue to learn and grow as the years progress. Her favourite part of working with Dr. Raj is his open and accepting personality. He treats patients, staff, family, and friends all on the same level. When a patient walks into the office they are treated as an equal and it makes for a professional, easygoing and upbeat office. Merissa’s favourite part of her job is the opportunity everyday to meet new and exciting people, hearing their stories and catching up at every visit. Outside of the office, Merissa enjoys spending time with her son and family, she is a singer with the church she belongs to and spends her time giving back to her community.